This lovely Children's Book Themed Baby Shower was sent by Cat Harper who is a party planner and owner the Cherry On Top Events Party Blog. 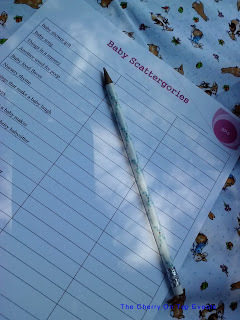 This past weekend we attended a totally adorable baby shower. As Party Planners this is usually a double edged sword. We usually walk into a shower and think "we would have done this here, that there" and think "we would have helped!" 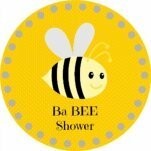 but occasionally we'll attend a shower where there isn't a single thing we would have done differently! 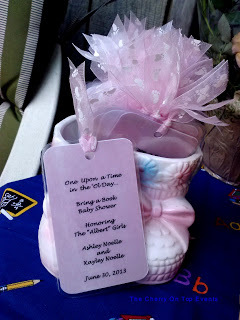 This weekends Bring A Book Baby Shower was one of those that was simply wonderful! 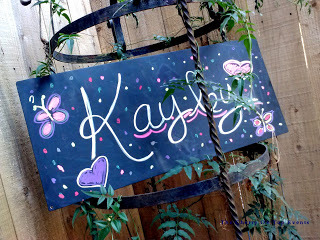 The happy couple had not revealed their baby's name until the shower so guests arrived to find little touches like this hand drawn chalk art! 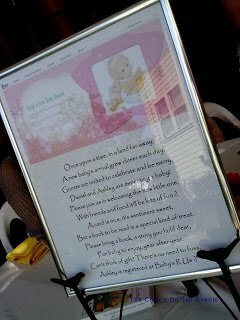 As they walked into the shower space, the lovely shaded back yard of one of the Gramma's-to-be, they passed by a printed, framed version of the E-vite that was sent out to each guest. 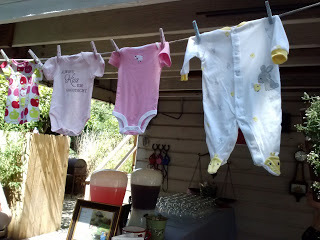 Hanging over the food tables were lots of new little outfits for the Mama-to-be to take home! 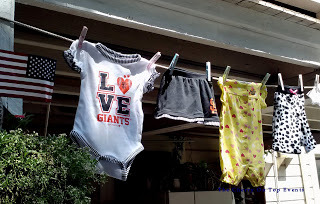 They are San Francisco Giants fans so this one was particularly perfect for them! The space for the food and drinks was the overhang of a balcony. The perfect shaded space to protect the food from the sun as well as a perfect spot to hang the baby clothes for added decoration. The gift table was to the back of the space in a corner with a comfy chair for when the Mama-to-be opened the gifts. All the details were book related so it was so cute to find this slightly modified Nursery Rhyme on that table. 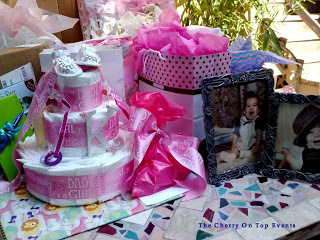 Our touch was the Diaper Cake which played the part of Centerpiece for the gift table. The above Nursery Rhyme and framed photos of the Mama and Daddy-to-be were displayed on each side. As guests arrived their gifts were arranged around these pieces for a beautiful display! Each table was decorated to match a particular genre. Each guest was asked to bring a book and then asked for the title of the book they were bringing so that the tables could be themed around those books. 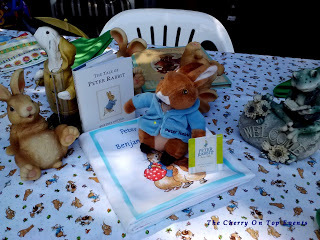 This is the Peter Rabbit table. We brought the little book but the Gramma-to-be who threw the shower made the little soft baby book version! Little figurines of bunnies and toads helped make the charming centerpiece for this table and were found at discount stores. 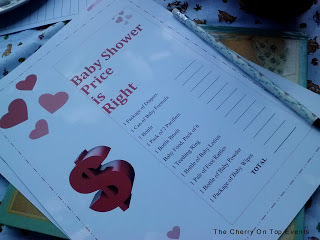 What a great way to set the theme and save a whole bunch of money! Framed maternity photos were displayed throughout the party site. 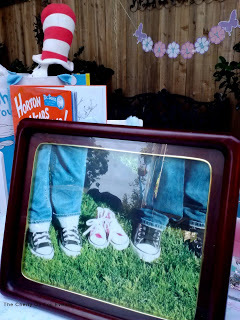 This one, on the Dr. Suess Table, was one of the photos the couple used to announce their pregnancy! SO adorable! 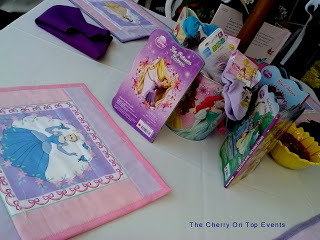 As huge Disney fans there were actually two tables themed towards Disney. This one was all about the Princess! The "placemats" you see were actually sewn by the Gramma-to-be and are burp cloths for the Mama-to-be to take home with her after the party! 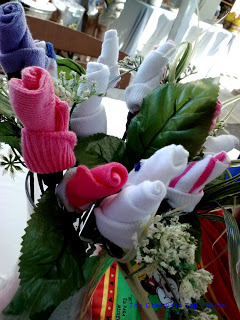 In fact, there were many little gifts waiting for the Mama-to-be on each table, like this too-cute baby sock rose bouquet! Tucked in with a little faux greenery this helped make the centerpiece for the other Disney themed table! 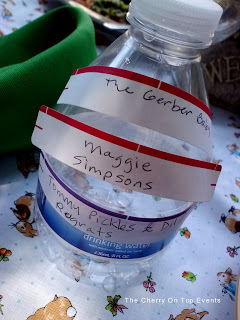 When having an outdoor event during summer it is always very, very important to have cold drinks available during the entire event. 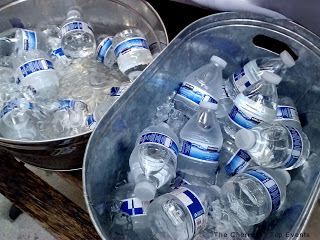 We were all grateful to find these tins full of ice cold water waiting for us as we made our way to the tables. 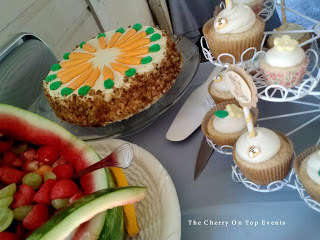 They were kept full for the entire party and the hostess was mindful of the warm weather and made sure to offer more to her guests from time to time. The theme of the shower was a secret from the Mama-to-be so she arrived about 45 minutes after everyone else so we would all have time to set our books out onto the tables before she made her grand entrance. 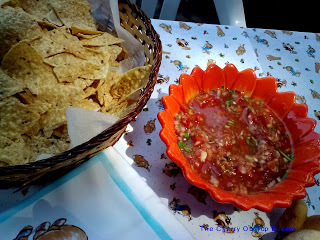 Since we were waiting about 90 minutes for our lunch the hostess kept us happy with chips and homemade salsa on the tables as well as veggies and dip. 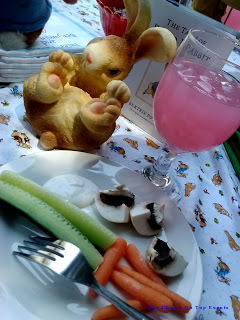 Along with our appetizers we were served either Pink Lemonade or Arnold Palmer's! The perfect light drinks to match the hot weather. After the Guest of Honor arrived we played our first Shower Game. The Internet is a wonderful thing to use while planning a shower. Lots of game ideas are available and many have free downloadable templates that you can just print out! The first one was a timed game where we were given letters and had to come up with answers that started with that letter! Our letters, chosen by the Mama-to-be, were K and R. Believe me, it wasn't easy to come up with answers but it was tons of fun! The second game was one we had played before but it is so much fun and sparks all sorts of conversation at the tables. We all worked in pairs so there was a lot of intense whispering going on! Sadly, even though one of us has a baby, we didn't have the edge here. We came up with a total of $85 and the actual total was a little over $92...the winner got it within about 30 cents! Then it was time for our lunch! 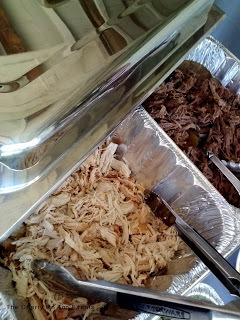 We were completely spoiled with homemade shredded chicken and beef that was so good we went back for seconds! 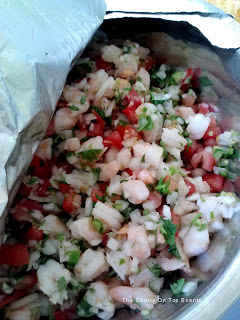 There was even fresh shrimp ceviche dressed with cilantro and lime! 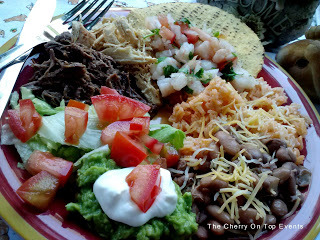 There were tostada rounds at the beginning of the buffet table for a little salty crunchy texture for our meal. 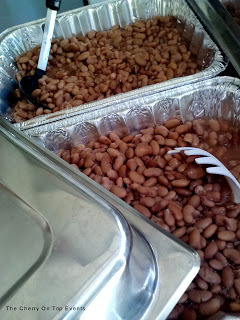 The homemade beans were amazing as one of our sides. Too often they would end up mushy due to being held in serving dishes and being kept warm for so long but these were perfect. They still had a bit of bite to them. 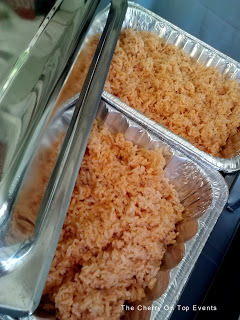 Seasoned rice rounded out our sides and made for very happy guests and full plates! 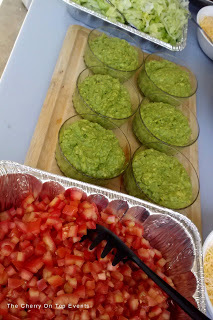 As if that were not enough, when we reached the end of the buffet line we found shredded lettuce, fresh chopped tomatoes, shredded cheese, sour cream and simply amazing homemade guacamole! Now who wouldn't want to sit down to a plate that looks like this one?! We were simply spoiled! During lunch we played another game that turned out to be the hit of the day. 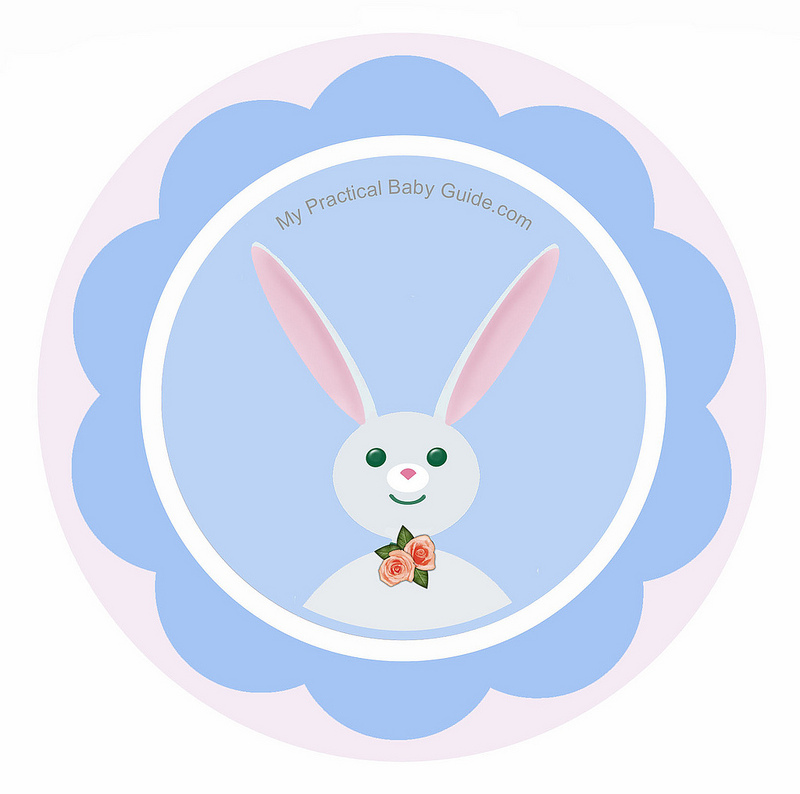 "Famous" baby names were written on labels and then stuck to the guests foreheads, necks or backs (wherever they couldn't read their own label) and then they had to ask questions about "their" baby like "is this a boy or girl? 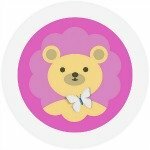 are the baby's parents famous? Do they have a reality show?" until the guest was able to guess the identity. This was so much fun that most of us asked for another label so we could play again! We were spoiled again by the Dessert Table. 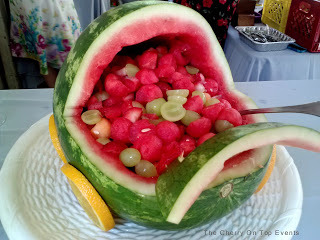 There was this adorable baby carriage carved from a watermelon and then filled with watermelon balls, cantaloupe and sliced grapes at the beginning of that buffet table. 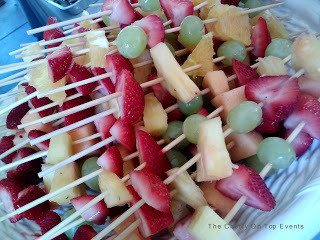 Fruit skewers of pineapple, strawberries, grapes and cantaloupe were at the other end of the table. In between were the sweet treats. 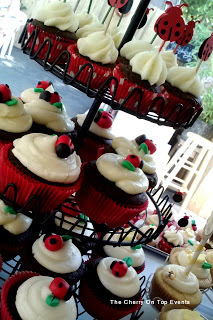 A family friend had made all of the little cupcakes which included these mini's topped with little candies or cupcake picks. Another nod to the book theme were these Winnie The Pooh cupcakes. 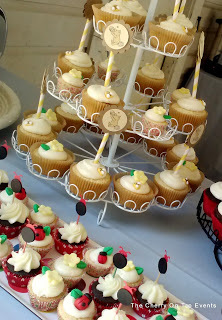 They were my favorite because they used paper straws as a way to display the little hand stamped Winnie The Pooh's. SO cute! 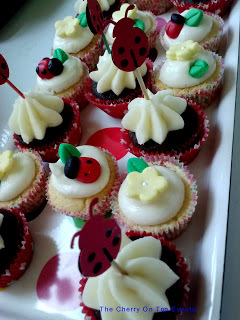 The little lady bug's on the full sized chocolate cupcakes were made from hand-rolled fondant as were the little leaves and flowers. Sweet, soft and yummy! There was even a luscious carrot cake. Yes, even with the desserts we were being totally spoiled! 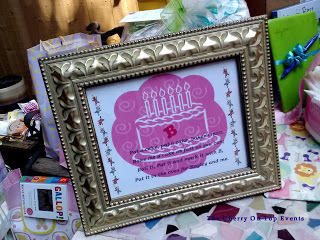 My favorite detail of the day were the little framed Nursery Rhymes that were placed all over the party site. This one was on the drink table. 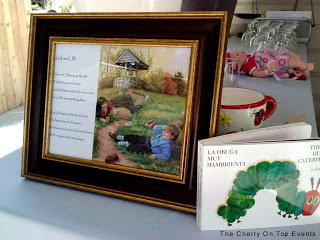 Displaying this in a decorative frame was a great way to highlight the rhyme as well as dress up the space. In many cases these details were paired with a book from a guest. The secret to these wonderfully framed rhymes? They were all printed out from online! Yup, practically free! Even the favors were book themed. This basket of "Magic Beans" was displayed on a school and book themed fabric remnant. In fact, most of the table fabrics were remnants. What a great way to save money and set your theme beautifully! 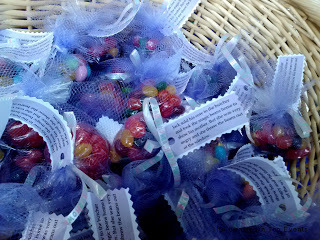 The jelly bean favors were wrapped up in tulle rounds and tied with ribbon and a tag that had a quote from the book Jack and the Beanstalk. 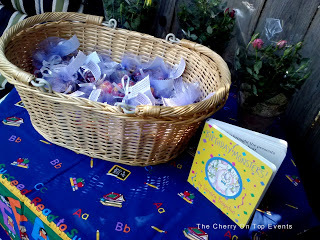 But the most touching favor were the little hand-made bookmarks by the other Gramma-to-be. They begin with "One upon a Time in the ol' Day" because when the Mama-to-be was a toddler she would grab a book and pretend to read it. Didn't matter if it was upside down or if she was reading it back to front, the story always started out with "On upon a Time in the ol' Day". 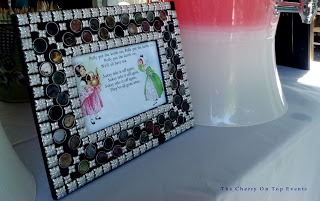 What a sweet touch for her favors and a wonderful story for the party. We are always telling our clients that the details are everything. Can you have a fun party without them? Sure you can. But you can't have a GREAT party without them. So take the time to add the details to your party and you will add to the delight for your guests and for your Guest of Honor. One more way to shower her with love.